MINNEAPOLIS, Minn. -- Prince was cremated Saturday and a group of his "most beloved" family, friends and musicians celebrated him afterward in a small, private service, his publicist said. Yvette Noel-Schure said in a statement that the 57-year-old music superstar's family and friends gathered "in a private, beautiful ceremony" to say a loving goodbye. The statement did not say where the service was held, but friends such as percussionist Sheila E. and bassist Larry Graham were both seen Saturday entering Prince's suburban Minneapolis estate, Paisley Park. Prince's sister Tyka Nelson and brother-in-law Maurice Phillips also were seen on the grounds, as were catering trucks. Hundreds of fans were gathered outside the estate, where a security fence was covered with purple balloons, flowers, signs and more honoring Prince, who both lived and recorded there. Round purple boxes were handed out to some fans. Each box contained a handout with a color photo of the late musician and a black T-shirt with "3121" printed on it in white - the numbers were the title of a Prince album. The publicist's brief statement repeated that the cause of Prince's death was unknown, and said autopsy results wouldn't be received for at least four weeks. The statement said the "final storage" of Prince's remains would be private and that a musical celebration would be held at a future date. "We ask for your blessings and prayers of comfort for his family and close friends at this time," the statement said. Prince was last seen alive by an acquaintance who dropped him off at Paisley Park at 8 p.m. Wednesday, according to Carver County Sheriff Jim Olson. 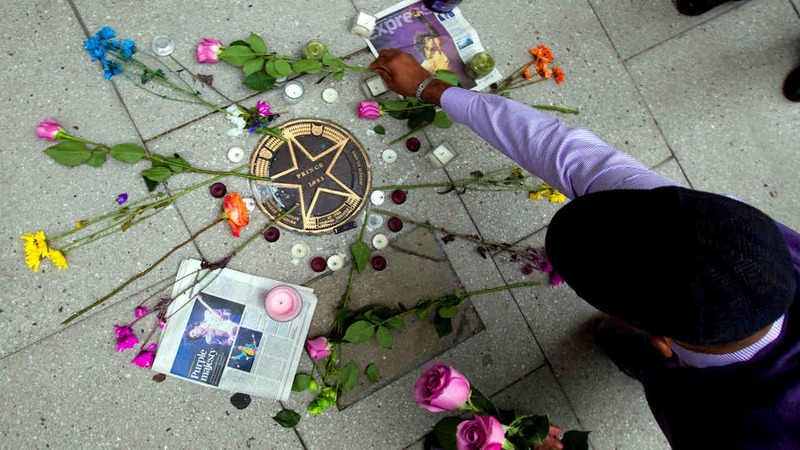 The "Purple Rain" star, born Prince Rogers Nelson, was found by staff members who went to the compound in Chanhassen, about 20 miles outside Minneapolis, the next morning when they couldn't reach him by phone. Representatives for Prince have not responded to requests from The Associated Press for comment on the reports of the emergency landing and overdose treatment, and Saturday's statement from his publicist did not address them. Olson, the sheriff, and a medical examiner's office spokeswoman declined Friday to say whether prescription drugs were taken from the home after his death. Olson did say emergency workers did not administer Narcan, a drug they carry to counteract overdoses, when they responded to Paisley Park. Prince's death came two weeks after he canceled concerts in Atlanta, saying he wasn't feeling well. He played a pair of makeup shows April 14 in that city, apologizing to the crowd shortly after coming on stage. Early in the first show, he briefly disappeared from the stage without explanation. After about a minute he returned and apologized, saying he didn't realize how emotional the songs could be. He played the rest of the show without incident and performed three encores. Then came the reported emergency landing en route to Minnesota. The night after that, Prince hosted a dance party at Paisley Park, where some fans said he looked fine and seemed irked by reports of an illness. Prince didn't play except to tap out a few notes on a piano, and lingered only for a few minutes before disappearing. Sheila E. has told the AP that Prince had physical issues from performing, citing hip and knee problems that she said came from years of jumping off risers and stage speakers in heels. But she said she hadn't talked directly with him in several months.